OK, so I had some time this afternoon to crank out another post which will be automatically posted tomorrow morning at the time of my flight taking off from Hong Kong to Chicago. This post is actually quite appropriate, given my planned activities tomorrow of flying across the Pacific Ocean. See, I have 4 hours in Chicago before I head to Atlanta. I would love to see my Mom and Grammy in the airport for a couple of hours before flying out, and this should, in theory, be very doable. However, I'm not 100% sure of the process for flying into the US then having a domestic connection--I'm about 95% sure I need to go through customs, pick up my checked bags, recheck them, and all that. Which, of course, is a practice that I have not encountered anywhere else. Because the US is really cool, efficient, and not paranoid at all about terrorism like that. Anyway, so I was trying to look online at the exact process that I will be going through at O'Hare on Monday. I consequently came across the O'Hare Airport Wikitravel article. This article was incredibly harsh. The author had clearly been abused as a child, because the amount of spite dripping from his/her every word was just shocking. Among the most grievous-"This is no Changi (Singapore--my parenthesis, not theirs), no Kansai; in other words, it's nobody's favorite airport." Just to make things very clear--I would bet every penny I have that I have flown to many, many more airports than the person that wrote this post. And I assure you, O'Hare is indeed my favorite airport, you clod. Now let's just establish this right now: I am not biased towards the United States. I am about as far from you can get from one of those idiots from the US who goes abroad preaching the gospel of George Bush, or Barack Obama, or Ronald Reagan, or the greatness of the new quadruple cheeseburger supreme with extra helpings of death from McDonald's, or the glory of Wal-Mart coming into China with their shuttle busses and destroying the microeconomies of fringe cities just so the Walton family can earn another few million dollars per hour. But I do love O'Hare Airport more than any other airport on this planet. 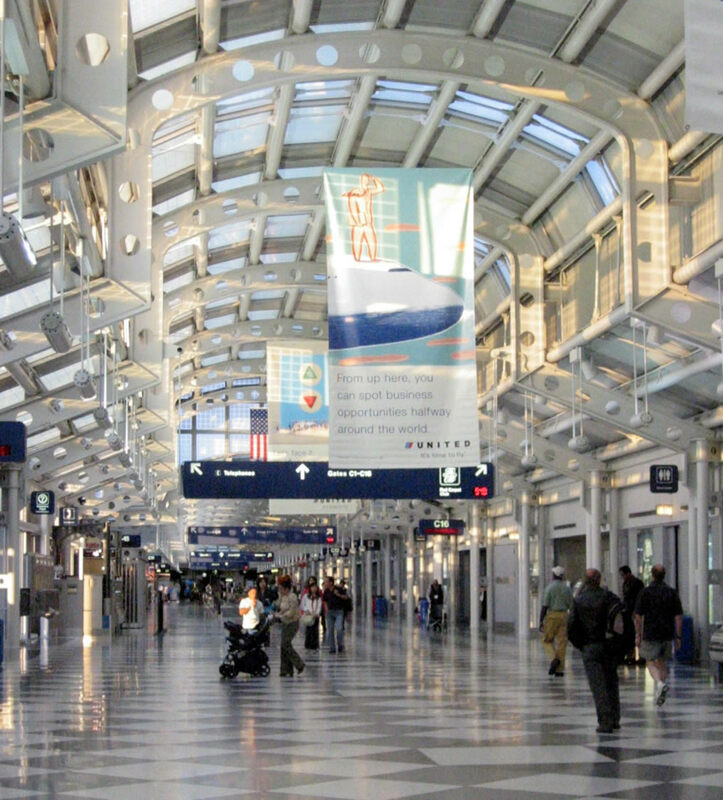 And while a small part of that probably is bias due to me just loving my hometown of Chicago, a large part of it is just that O'Hare is the freaking nuts (side note: I use the phrase "the nuts" pretty often in conversation with 2 of my best friends from HS/uni, Dan and Steve. It is a phrase indicating the best possible hand in poker, but we use it so much in the context of something being "good" that it's lost all meaning. I'm going to start using it in my blog. So from here on out, anything that's "the nuts" means very good). So anyway! O'Hare is the freaking nuts. Where else in the world can you find a massive underground tunnel taking you underneath the runway, complete with neon lights and moving walkways? Where else in the world can you find such a perfect compliment of really sleek, space-age architecture juxtaposed onto the very midwestern feel of Illinois? Where else can you find an airport which appeared in such iconic films as "Home Alone"?? 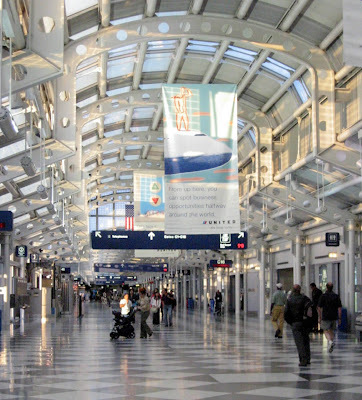 What other airport code makes as little sense as O'Hare=ORD? (Though the origin of this does in fact make perfect sense--O'Hare was initially called Orchard Field, hence ORD. But nowadays no one knows this, except the 5 readers of this blog). Furthermore, all I ever hear about from people badmouthing O'Hare are how every flight is delayed. Well, I have flown into/out of this airport literally dozens of times, and I'm pretty sure I've had like 2 delays. And yes, I understand that if the stats on on-time vs. delayed departures indicate a lot of flights are delayed, then there are indeed a lot of delayed flights, but I'm just saying, this is not a problem I have encountered ever, really.